Liczba stron: 114 Jest to ujednolicona liczba stron, która ułatwi Ci porównanie długości książek. Każda strona Legimi to 200 słów. Win More at the Casino – Master Craps, Poker, and Blackjack Today! Do you wish you could master the casino like James Bond? Would you like to banter with your fellow players while raking in your winnings? Are you ready to step up to a table game for the first time – with the knowledge you need to win big?This 3-in-1 book bundle includes complete guides to three of the most popular casino games. With your purchase, you’ll get 3 full books:	How to Play Craps	How to Play Texas Hold'em Poker	How to Play Blackjack	When you open up How to Play Craps, you’ll learn the ins and outs of this classic casino game in a flash! This easy-to-understand guide explains the rules of the game, the basics of craps strategy, and even the “beyond the basics” tips you need to truly master craps. Soon, you’ll have the confidence to leave the sidelines and run the table! You’ll also discover a complete section on craps lingo, like “new shooter coming out!”	How to Play Texas Hold'em Poker is your complete guide to this exciting and very popular game. From the basic rules, hand types, and table positions to advanced strategy, you’ll love this book’s straightforward approach to learning Texas Hold’em. From table etiquette to hold’em mythbusting, this book has everything you need to win big at this incredibly popular and exciting game! 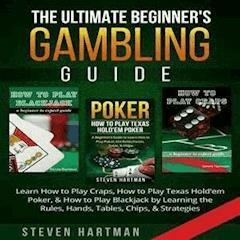 This book includes powerful “first-time tactics” for poker beginners! Inside How to Play Blackjack, you’ll discover powerful, moneymaking tips for making money at “21”. This book explains how and when to pocket your winnings and the “Add a Chip” method with simple instructions and compelling examples. You’ll have fun and increase your chances of winning – even on your very first visit to the blackjack tables! You’ll even learn about blackjack table etiquette – including where to put your cards, chips, drinks, and cigarettes. Don’t wait – get this powerful 3-in-1 book set and make every visit to the casino as fun and lucrative as possible. Welcome to the Craps Table! How Do I Win Once a Point Has Been Established? How Do I Lose Once a Point Has Been Established? What happens if the point is 6, I put money on 8, and the dealer rolls a 6? What’s a 2-Way Hard (number)? Welcome to the Blackjack Table! You’ve heard the sudden bursts of cheers as you’ve strolled past the crowded Craps table. You have even seen the countless TV shows and movies with the dice flying in slow motion over the green felt before knocking against the wall. The dealer barks out, “Winner!” and then the table roars with applause. But as you step up to an empty, unused craps table in a Vegas casino just to survey the complex boxes with terms like “Field” and“PassLine”,you’rehesitant.Youhavesecondthoughtsabout going to an active table and putting $20 down because it just seems so impossible to play. And then there isn’t just one dealer like at the blackjack table or roulette wheel, but four! A bead of sweat tickles your brow and you walk away from the intimidating Craps table and decide to invest your money at the Wheel of Fortune slot machine or tackle a few hands at the three-card poker table. Thisbookisdesignedforthebeginnerwhohasalwayswanted to experience the thrill of throwing the dice but was too afraid to learn how to play. Worry not, shooter, this guide will have everything you need to step up to the table with confidence and have fun playing the wild game of Craps! The first part of this book is going to explain the bare bones of Craps. This will be a short introduction into throwing the dice and what the numbers mean when they come up. The second part of this book will explain the Craps table and break down what the numbers and terms on the green felt means. We will then explain the game in further detail and what to expect when the dice goes out, when you can bet, when you may win or lose money, and when your bet is safe. Now that you know the table and the basics, it’s time to go beyondthebasics.Whataresomefunbetstoplay?Whyaresome people making strange bets? Part of the fun of playing Craps is the seemingly goofy lingo thatgoesalongwithit.“Yo,11,”“NinaattheMarina,”and“Crap check,”arejustafewexamplesofwhatyoucanshoutoutorwhat the dealers may call out. After you spend a few minutes at the Craps table, you will discover that there is a lot of superstition. This means certain words or phrases uttered will give you death stares and looks of concern. We will cover the words you should avoid when at the table and proper etiquette. Finally, we will give you a few tips on what you should do when you step up to the table for the first time. A few months after I turned 21, my uncle insisted that I learned how to play Craps. We headed out to a nearby casino where he spent 5-10 minutes explaining the process and giving me a lesson on the game. That stuck with me because I fully believe it. There is nothing like getting your hands dirty when it comes to learning. You could read all the material you want on how to drive a car but until you put the car into D and step on the gas pedal, you won’t completely grasp the concept. This book is going to teach you how to play Craps, but you will really learn how the game goes once you have money on the table. This will by no means cover the game of Craps, but this section is going to briefly tell you how the game is played. This will make learning everything else a little easier. Craps is played with a pair of 6-sided dice. The first roll of the dice is called the come-out roll. If the shooter rolls a 7 or 11, it’s a winner. If the shooter rolls a 2, 3, or 12, it’s called Craps and it loses. If the shooter makes the point, the game essentially restarts. They keep the dice and come out again. And that really is the absolute basics of the game. All the numbers and boxes can be somewhat overwhelming but we’re going to break it down so that you have an easier time comprehending what it all means. This is where playing Craps gets a little tricky because it’s hard to explain the table without also explaining how the game is played. You know the basics from the previous chapter so that should help out. We will pepper this chapter with a little more about the game but won’t go into much detail. Picture yourself at the far end of one side of the table. ThePassLinemeansyouareplayingbasedontheroller.Once you place a chip down into this area, you cannot remove it until you win…that is unless you lose, then the dealer will take it down for you. Placing a chip in the Don’t Pass Bar section means you are betting against the roller – essentially, you are playing with the casino because if the roller loses, you win. The Big 6 and Big 8 on the corner pay even money. You can place a chip down at any time and remove it at any time (so long as you haven’t lost it). Don’t place or remove a bet if the dice are out.Youhavethepowertoputdownandpickupyourownchip, you do not need the dealer to do it for you. There are 7 numbers in the section known as the field: 2, 3, 4, 9, 10, 11, and 12. The field is a one-time bet which means you win or lose your money based on the next roll after you put the money down. Casinos have different payouts for this section but you will receive even money ($5 bet pays $5) unless it is a 2 or 12 which generally will pay 2:1 or 3:1 odds on your money. A $5 bet in the field on a 2 or 12 roll can win you $10 or $15. Very rarely will the remaining numbers of 3, 4, 9, 10, and 11 pay greater than even money; the exception being that 3 or 11 may have higher odds. When a roller is shooting for the first time, it’s called a come-out roll. The areas labeled Come and Don’t Come Bar are designed for those wanting to place a bet similar to a come-out roll after the shooter has started rolling the dice and a number (or point) has already been established. Now, you may already be confused, but don’t worry, this will make sense when we get into the way the game is played. Points are those six numbers up top: 4, 5, 6, 8, 9, and 10. Without getting into too much detail yet, the points are determined when the roller shoots. If they roll one of those six numbers, in order for you to win, they need to reroll that number before rolling a 7 (more on this later). As you can see there are pictures of dice, numbers, and odds. The odds may vary based on the casino but these are generally what you can expect. Seven – This is a one-time bet when you think the roller is about to roll a 7. It generally pays 5:1. Any Craps – This one-time bet means you are betting on the roller shooting a 2, 3, or 12 on the next roll. 2, 3, 11, 12 – These are listed as dice just above the “Any Craps” box. These are also one-time bets with varying odds of winning. The difference between these numbers and the “Any Craps” section is that you are betting on the individual number and not the 4 numbers as a whole – that’s why the odds of winning are lower. gambling that the roller will roll two dice with the same amount of dots (2 x 1s and 2 x 6s are not included here because that’s the only way a 2 or 12 can come up). An example is in order to roll 8, you can roll these combinations: 2 & 6, 3 & 5, or 4 & 4. If you roll a 2 & 6 or 3 & 5, it’s called an easy eight. If you roll a 4 & 4, it’s called a hard eight. When you place a bet on a hard eight, for example, you are betting that IF the shooter rolls an 8, it will be 4 & 4. If they roll it any other way, you lose. Next to the middle boxes are circles with a C or an E. The C stands for Craps and the E stands for 11. These are one-time bets as well so betting here means you are anticipating that the next roll will be an 11 to win E or a 2, 3, or 12 to win C.